Will Webb could have gone anywhere for his Master of Arts degree. He was easily accepted into three other prominent Ontario universities for post-graduate studies – and all offers of admission came with top-dollar scholarships. 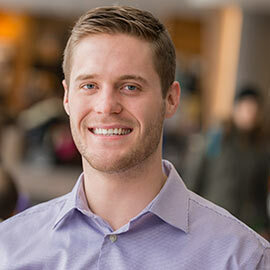 But for Webb, a Waterloo native and recent Laurier graduate, it was the outstanding reputation of faculty members in Laurier’s Department of Communication Studies that kept him on the Golden Hawk grounds for his graduate studies. Since starting his graduate work in the fall of 2015, Webb has had the opportunity to work as a paid research assistant for de Peuter. While he has worked on a variety of projects in this role, one of Webb’s major tasks was the organization of a large-scale public forum last September. The forum, bringing researchers, activists, and lawyers together, took aim at the issue of unpaid internships in the creative industries, a topic that Webb has first-hand expertise with. His article on unpaid internships in Ontario was published in triple C: Communication, Capitalism & Critique. In addition to his teaching assistantship in a first-year media history course, Webb has been involved with groups such as the Canadian Association of Cultural Studies, where he helped with social media efforts during its biannual conference recently held in Waterloo. The ability to integrate with professors, mentors, and other experts in the field is an added bonus. “You’re part of the team here,” said Webb. The team-like feeling is one that carries over to the classroom environment. As one of ten students in the Communication Studies master’s program, Webb enjoys the small class size, noting how it provides a perfect atmosphere for rich dialogue and exchange interaction with the professors. Webb also gives the program top marks for course content. With courses in strategic communications, visual communication and culture and social media, he is confident that what he learns in the classroom will be relevant in the competitive job market. Webb hopes to leverage his education and skill set with a career in communications or public relations, ideally working in the public sector or a not-for-profit organization. “Right now, I’m getting relevant content and tangible skills,” said Webb. “I think employers want that."